What's the Best Rapid Mobile App Development Platform According to Customers? Marketers can hype, but customers don’t lie. If your product fails to meet customers’ expectations, they’ll tell you…and then they will tell everyone. This is a blessing to software shoppers, as they scour product review websites to get the inside scoop on the products they’re evaluating. 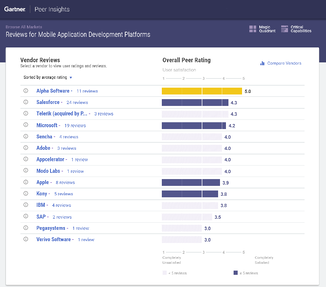 Gartner Peer Insights website lists Alpha Anywhere as the only rapid mobile application development platform with more than 10 perfect scores from enterprises. Based on customer reviews, Alpha Anywhere ranks higher than the best-known MADP and RMAD solutions on the market on the scorecard. Alpha Anywhere premiered with perfect scores from customers on peer review sites Capterra and G2Crowd. At Alpha Software, our focus is on meeting and beating customers’ expectations. To do this we need to do two things well: listen and respond. It’s part of our DNA. Customer requests drive our product roadmap – being first to market with offline built-in was a direct result of listening to our customers and seeing a trend before the rest of the market. Customer challenges drive our services and training offers – our new mentoring packages were a creative solution to customers with different skill levels and unique time constraints. Customer needs drive our innovation – the new sample apps we’ve released are a direct result of customers needing starting points for the next generation of mobile forms. Whether we're facing a particularly challenging customer deployment or simply touching base with a loyal customer - our best innovations came from our conversations with customers. You spoke. We listened. Thank you from the bottom of our heart. To read why Alpha Anywhere roadmap plans exceeded customer expectations at the recent 2016 Alpha DevCon conference, click here. To learn how customers are benefitting from Alpha Anywhere product innovations, click here. Think Alpha Anywhere could be a fit for your organization? Try Alpha Anywhere free for 30 days.